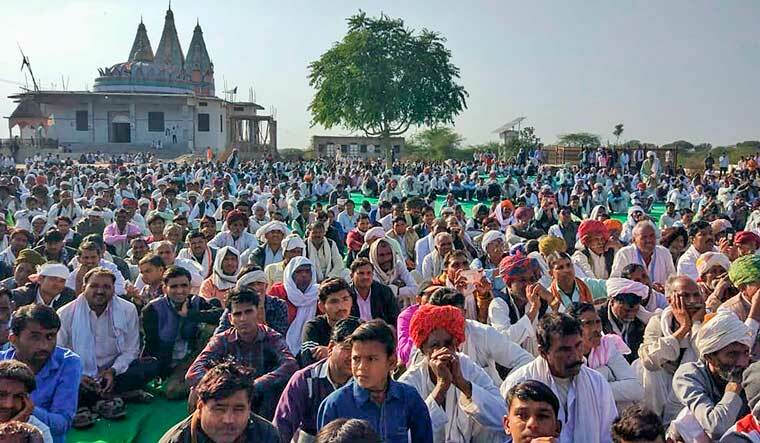 Rajasthan is being shaken in parts by the Gujjar agitation that entered the fourth day on Monday, and it is not the state Chief Minister Ashok Gehlot but Prime Minister Narendra Modi who is facing the brunt of it. The Gujjars say they will not back off until their demands are met. The Gujjars have shown that their agitation does not have to get violent like the Jat agitation in Haryana did in February 2016, to put extreme pressure on the government. In Haryana, buses were burnt, and public property was razed to ground. In what seemed to be a "rasta roko", the Gujjars of Rajasthan, seeking reservation in jobs, schools and colleges, blocked the vital National Highway-11 connecting Agra and Jaipur with Delhi—the Golden triangle tourist circuit, which attracts people from all over the world during winter. On Sunday, the protesting Gujjars showed that they could resort to violence, provoking the police to fire into the air, resorting to lathi charges and imposing prohibitory orders in Dholpur and Karauli districts. The protest similarly saw them spill on the railway tracks on Monday, forcing the government to divert half a dozen trains, cancelling one and affected the schedule of an estimated 250 of them. Gujjar leader and the strategist of the agitation, Kirori Singh Bainsla, assured that the protests will not end until the government concedes their demand. While targeting the Central government, Bainsla also warned the Ashok Gehlot government in Rajasthan against doing anything to provoke the agitators, who are causing a law and order mayhem in the state. The state government has decided to be a silent spectator for now, because the granting of reservation does not fall within the purview of the state government. It is thus Prime Minister Modi who is caught in the range of the angry Gujjars. The fact that the Central government was able to see the 10 per cent reservation for the Economically Weaker Sections (EWS) through, has added a huge dose of determination to the Gujjar agitation.